ps: is it possible to upload images directly to this post? i couldn’t figure out how. I don’t think that feature currently exists. FAQ Desk: Feature Request explains the right location to ask for new features. Regarding results too wide to see the actual filenames: if you click in the Results window, and use Ctrl+A to select all, you can then paste the results into a normal Notepad++ editing pane (such as after File > New). If you trim out all the lines that start with a tab (such as Find what:(?-s)^\t. *\R, Replace with:`` (blank), enable Regular expression), it will just leave (mostly) just the filename rows, but delete the result rows… After that, you can do a search/replace (this time, case insensitive, without regular expression, so the windows backslash doesn’t become meaningful), where you search for the c:\folder\folder2\ and replace with .\ … then all the files are relative. But that is only a workaround, and won’t have the nice features of the find-in-files results window, sorry. ok thx, i’ll consider filing a report on gh, i just asked here first becasue i hoped it might already exist and also becasue this place seemed more active than gh. I really like this idea. I’d suggest a Preferences… option to replace leading Directory: text with ... in the Find result panel. 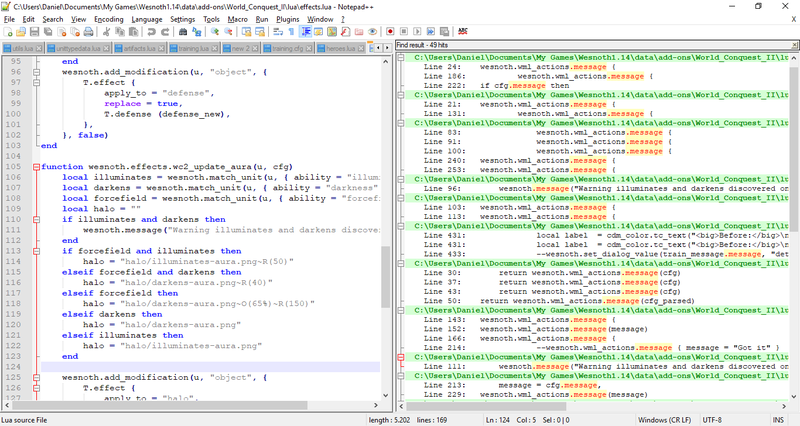 I would think (haven’t checked the Notepad++ source code) that in order to jump to hits when they are double-clicked in the Find result panel, Notepad++ actually reads the data out of the panel itself to determine file path…so it can switch to (or open) the necessary file and jump to the correct line. That way Notepad++ could put the complete path back together when needed.